A thrilling story showing how the disparate worlds of the Avengers and Conan the Barbarian ultimately work well together. After escaping with one of the soul shards in issue #5, the Scarlet Witch found herself in the middle of a desert, blinded, and surrounded by bandits. Fortunately, Conan the Barbarian arrived on the scene just in time to save her. The newly formed team, despite being worlds apart, decided to track down the thieves and recover the all-important shard less the evil goddess Nyx finds it. Jim Zub, Mark Waid, and Al Ewing prove they’re masters at integrating disparate characters into one cohesive story. 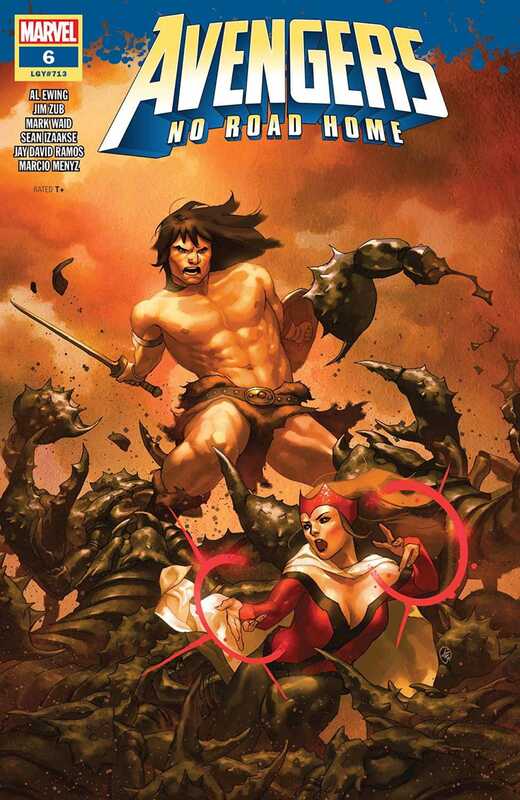 Wanda Maximoff and Conan share instant chemistry, which is largely due to their dark pasts. Readers can sympathize with each hero’s fight against the present evil forces while struggling to keep the trauma of their pasts at bay. Hawkeye, Hulk, and Rocket Raccoon aren’t fairing much better in the Nightmare realm. They too must come face-to-face with the darkness. Unfortunately, Hawkeye’s darkness comes in the form of the monstrous Hulk, who in a fit of rage reminds everyone of his previous death at the archer’s hands. 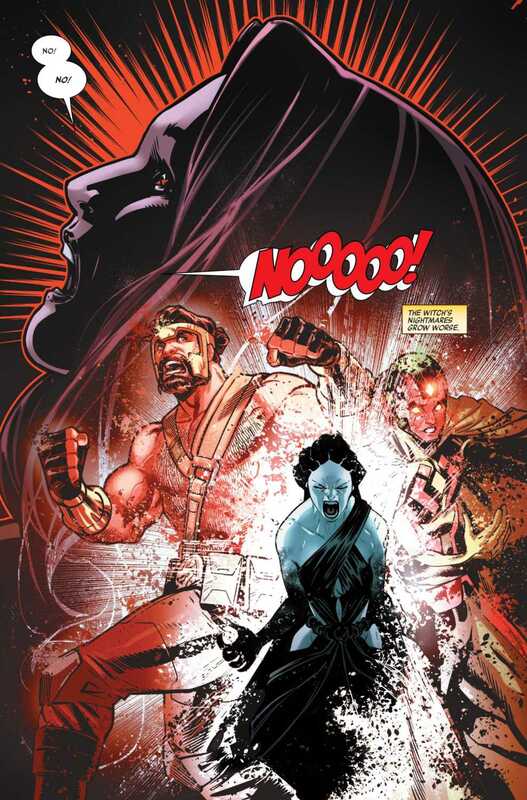 The story loops this scene into Wanda and Conan’s dreams, which effectively shows how the darkness of Nyx has infiltrated even the barbarian’s world. Readers can look forward to further expansion upon the Conan mythos as he and Wanda search for the shard. The developing relationship between these two unlikely teammates leaves one coming back for more. The artwork in this issue is phenomenal. Sean Izaakse’s penciling helps Wanda blend right into Conan’s ancient culture; you would never know she wasn’t from his world. In addition, Jay David Ramos and Marcio Menyz’ coloring features stark contrasts in hues to show the many differences between their respective dimensions. VC’s Cory Petit’s ties all this together through the narration, situating it in key spots to draw the reader’s eye to areas of most significance. Readers will also enjoy the covers. 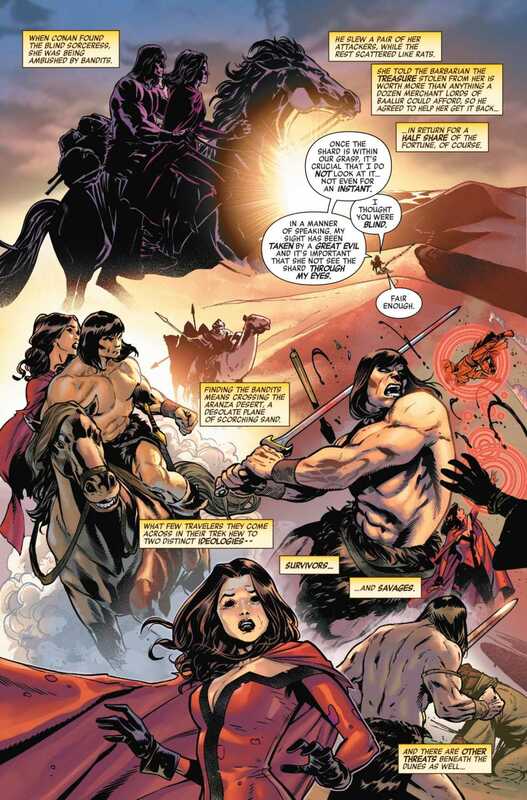 Yasmine Putri’s main cover focuses on Wanda and Conan’s intensity and chemistry by illustrating their fight with the bandits. 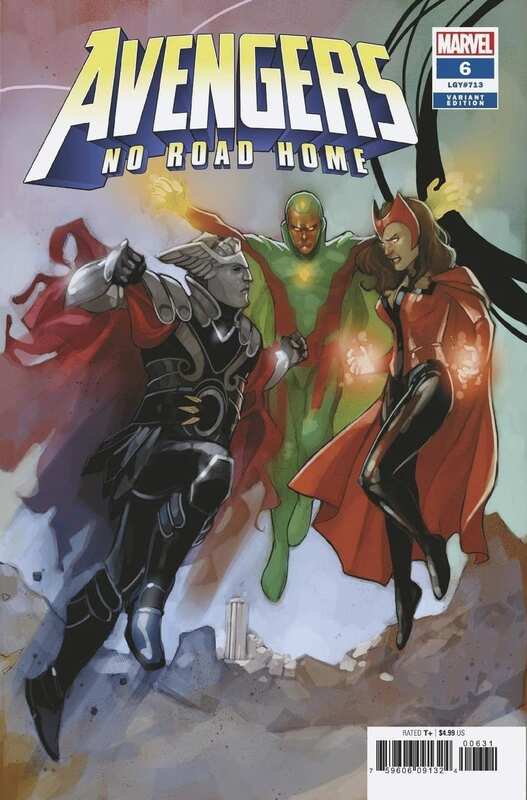 Phil Noto’s variant edition shows Hypnos the god of sleep attacking both Wanda and Vision, emphasizing the forces of darkness trying to tear the Avengers’ relationships apart. 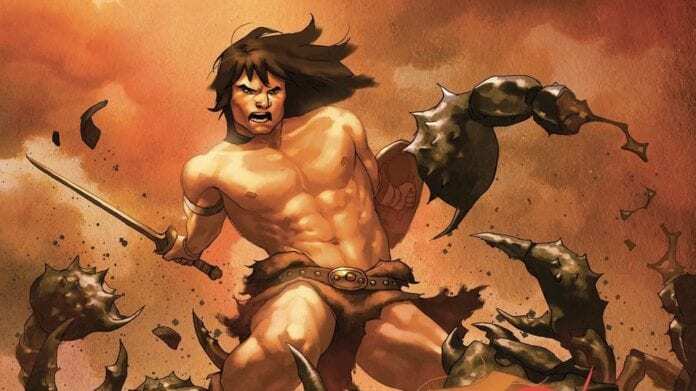 AVENGERS: NO ROAD HOME #6 introduces Conan in the smoothest way possible. Readers will appreciate the addition without feeling robbed of their Avengers story. Zub, Waid, and Ewing are expanding the heroes’ landscape in a remarkable way. 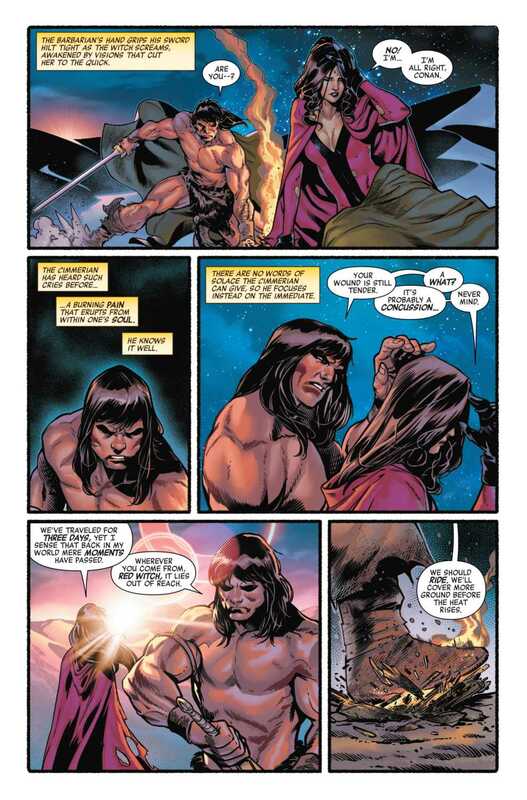 What did you think of the authors’ portrayal of Conan in this issue? Let us know in the comments below! A comic book nerd and reviewer with a special interest in the underlying themes of superhero, sci-fi and fantasy stories. He enjoys writing for Monkeys Fighting Robots, Pop Culture and Theology and other publications.